I sometimes envy painters. They can demonstrate their magic in real time. Full disclosure: I did watch Bob Ross painting his landscape scenes when I was home with babies. 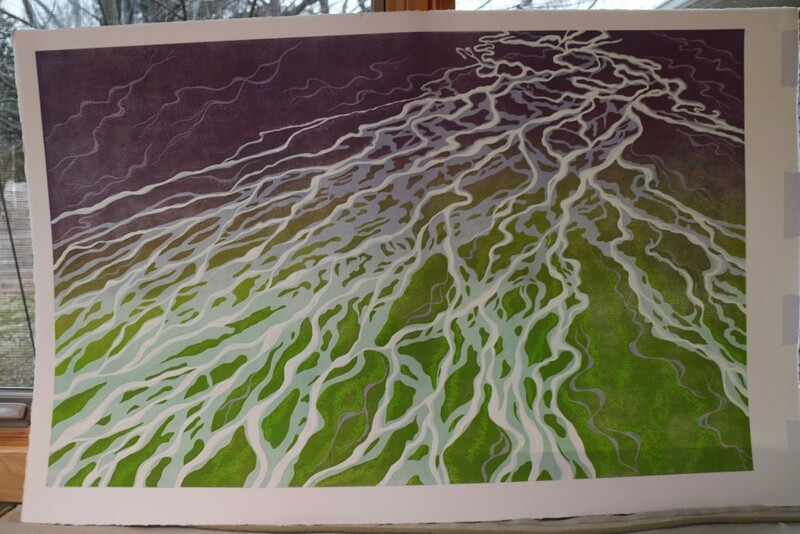 He was so calming and effortless in his movements as he drew craggy peaks out of black gessoed panels. I have the same challenge on Friday, October 2nd. 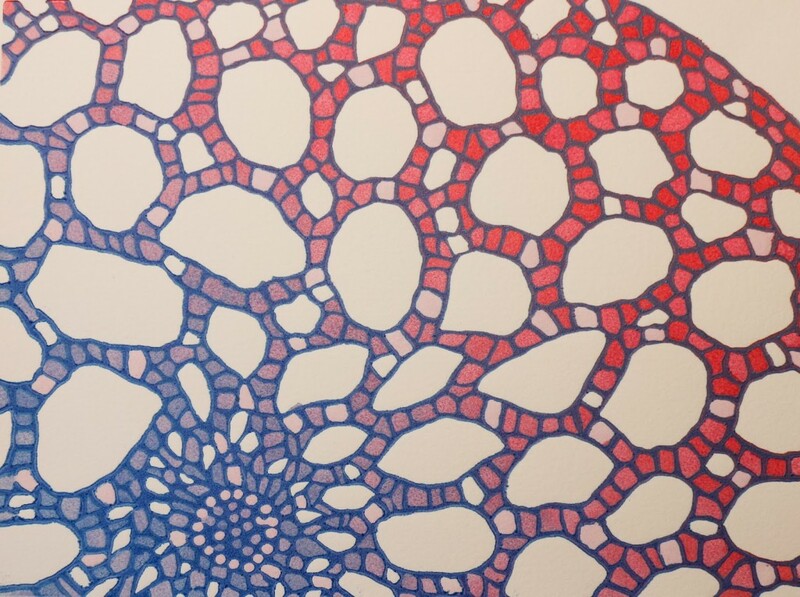 I am the visiting artist at First Friday Evening Science of Art at the WonderLab Museum of Science Health & Technology here in Bloomington. 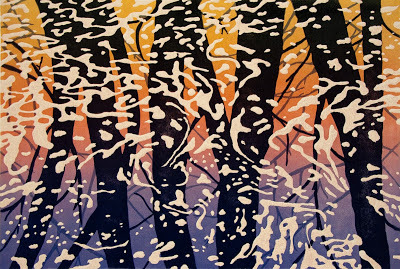 The entire evening will be printmaking — including letterpress and real leaf printing. And me. 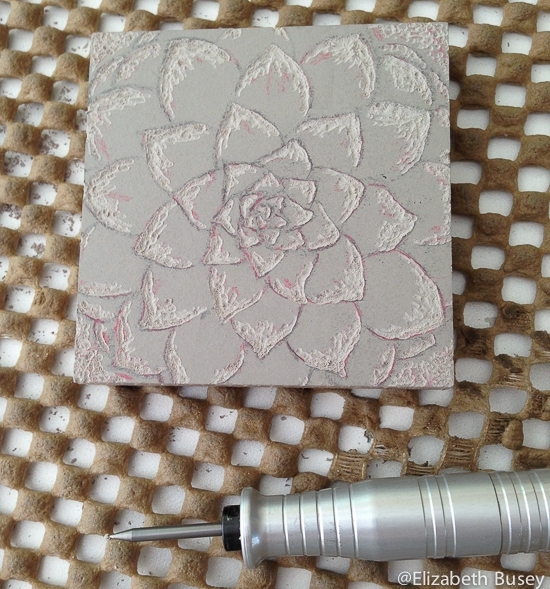 Carving with my trusty Foredom drill makes short work of a small block. For me, demonstrating on-site is tough. Watching someone carve linoleum can be a dull as dirt. I certainly can’t drag my press with me. 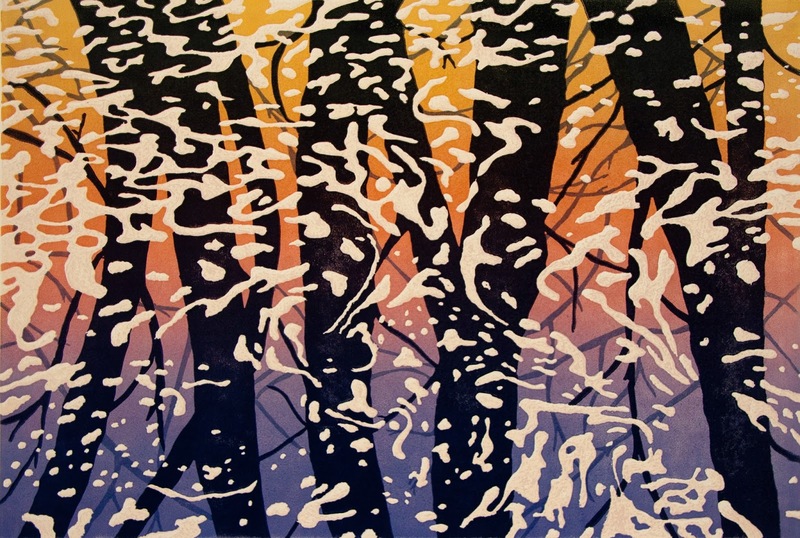 We had a wonderful time printing two-layered linocuts at my Open Studios tour in June, so I decided to do a variation of this for the WonderLab event. 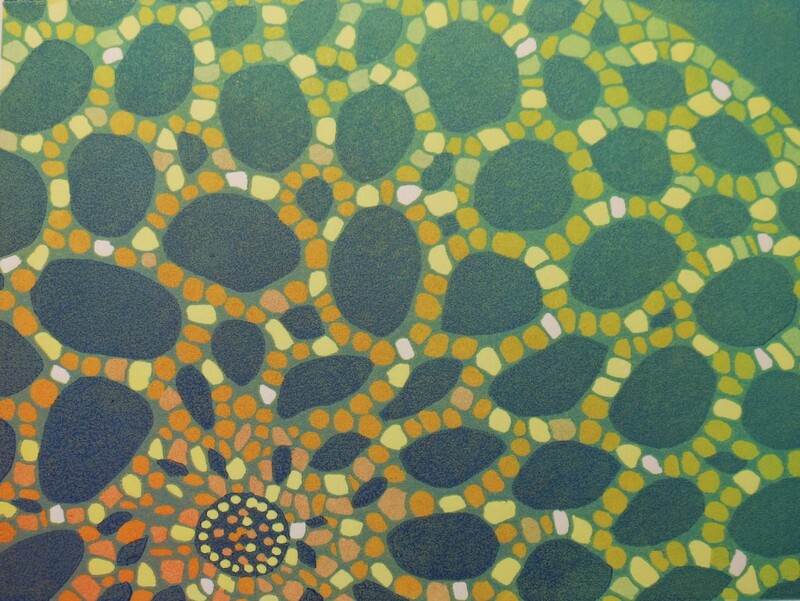 This entry was posted in Color Theory, Demonstration, Workshop and tagged blend roll, demonstration, Linocut, linoleum, plant, relief printmaking, spiral, WonderLab Museum on October 1, 2015 by Elizabeth Busey. I have been up against a self-imposed deadline. During February, I am the featured artist at the Bloomington Bagel Company. Besides the fabulous bagels, the venue has a large white, well-lit wall, and my people (folks who like or buy my art) eat there. So I wanted to get several leaf prints finished. Everyseed bagels are my sustenance of choice. But be safe — don’t eat in your studio. 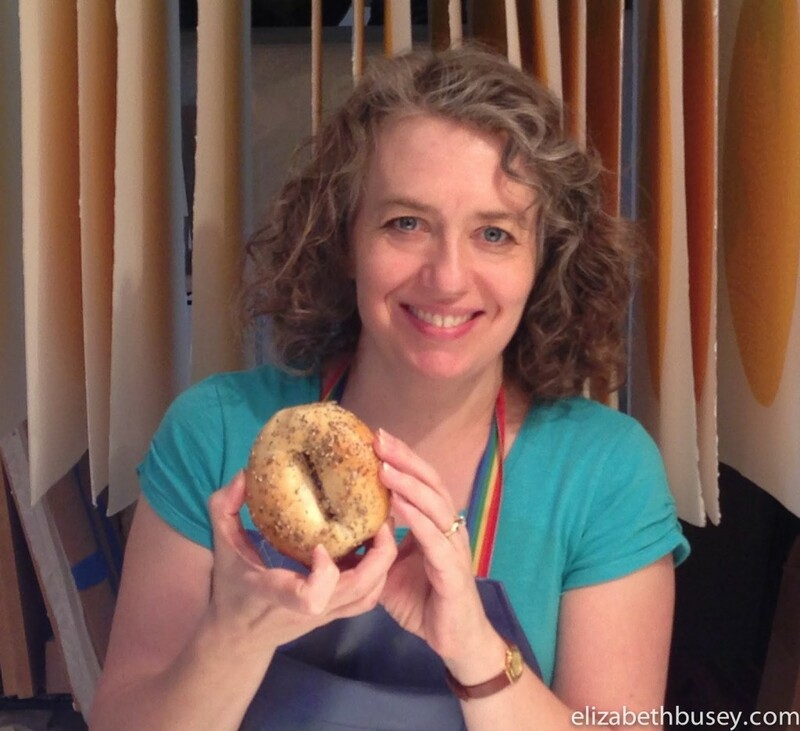 This entry was posted in Color Theory, Uncategorized and tagged Bloomington Bagel Company, darkness, leaf, Linocut, mellow, orange, printmaking, relief printmaking, segments, value, yellow on February 5, 2015 by Elizabeth Busey. I have been toying with some ideas for a few months. I have visions of layering and new materials. Of well, something different. But something too different can be scary or frustrating, so perhaps something somewhat different would be a good place to start. This was the conversation I had with myself this morning. When you work alone, you have to be your own motivator and artistic therapist. Pine Cone on Rives BFK with Chine Collé. 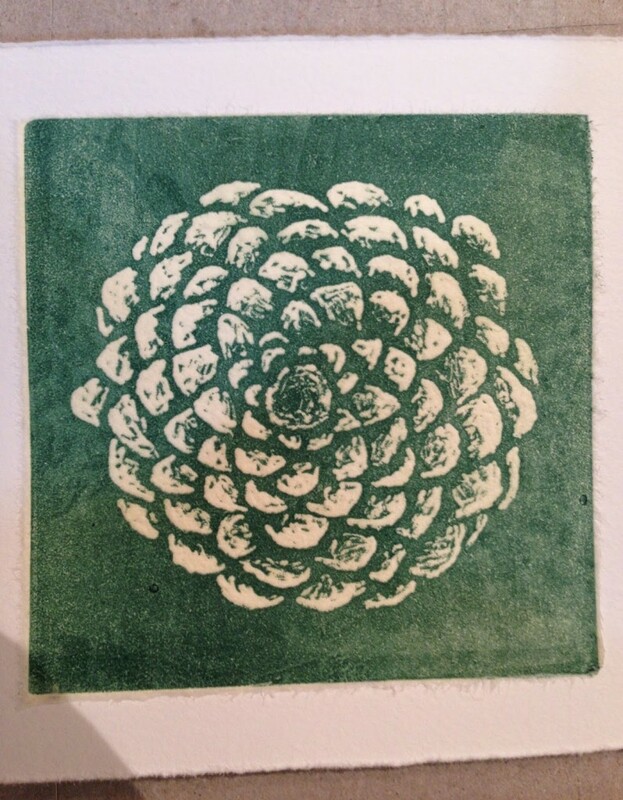 This entry was posted in Botanicals, Experimentation and tagged Brian Shure, chine collé, experimenting, Magical Secrets about Chine Collé, printmaking, relief printmaking on December 4, 2014 by Elizabeth Busey. They say that spring is “just around the corner,” but many in my small corner of the Midwest are dubious. Light snow and bone-chilling winds accompany us as we swerve around some pretty massive potholes. Driving into one is tough on the car’s suspension, and all I can do is grit my teeth and hope that these obstacles will be fixed soon. 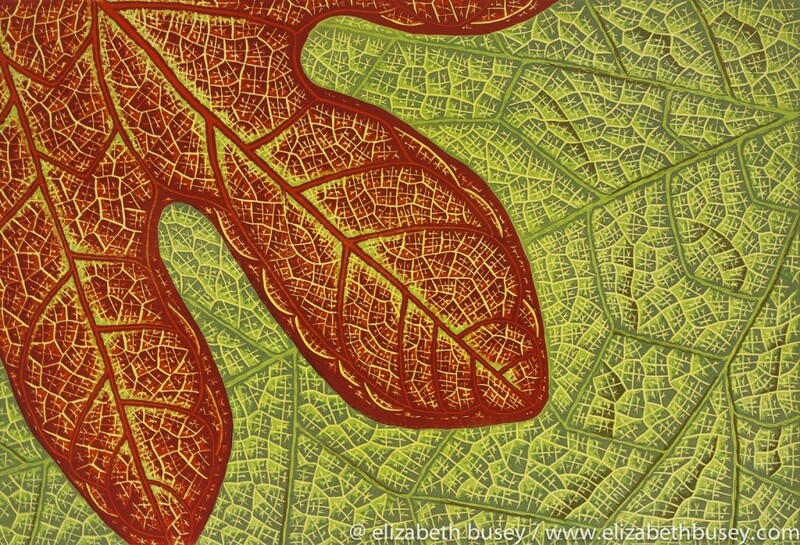 This entry was posted in Artistic Growth and tagged aging, carpal tunnel, pain, printmaking, relief printmaking, stress on March 27, 2014 by Elizabeth Busey.